Huawei's latest flagship impresses on paper. The Huawei P30 Pro has been officially unveiled at an event in Paris, with the handset's arrival confirming that many of the leaks were indeed correct. 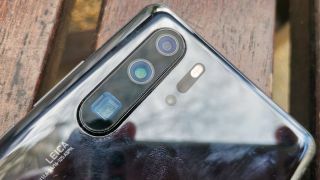 As numerous rumors have suggested, the Huawei P30 Pro is a camera phone packing four lenses, one of which is a Time-of-Flight sensor, and a mighty 5x optical zoom. This turns into a hybrid when pushed to 10x. The camera specs are indeed impressive. There's a 40MP, 27mm f/1.6 wide-angle lens (with OIS), a 20 MP 16mm f/2.2 ultrawide, a periscope 8MP 80mm f/3.4 telephoto (with 5x optical zoom with OIS), plus the ToF depth camera. When it comes to the front-facing camera, there's a decent 32MP sensor on board. Although the phone uses the same Kirin 980 chip seen in the Huawei Mate 20 Pro, Huawei believes that a number of software tweaks has made this one of the most powerful phones around and things that the P30 Pro will be the 'best smartphone camera in the industry'. We'll be the judge of that, however, when we review the things and consider it for our best camera phone guide. Some specs and features do indeed point to greatness, though. These include the ultra-wide angle offering more of a vista than before, better bokeh (thanks to the time of flight camera), an ISO range that goes up to a mighty 409,600 and the new RYYB system. This replaces the monochrome lens that was found on the Huawei P20 Pro. Its inclusion (the double Ys replace greens and apparently let in more light to the sensor), means that the P30 Pro has a totally redesigned CMOS sensor and filter combination. All processors, software and firmware had to be updated, too. Huawei has improved on the night capabilities of the camera (you just have to look at that ISO range to see that is the case), added mechanical OIS on the zoom lens and the 40MP main sensor and has combined this with AI stabilization. Portrait shots have been improved as well (there's more hair definition when shooting bokeh) and Super HDR (High Dynamic Range) has been overhauled. It now takes an entire heat map of exposure levels pixel by pixel, which means this should eliminate silhouetting. Zooming has also been given an overhaul, with the P30 Pro capable of a 5x optical zoom that won't degrade the image at all. Couple this with EMUI 9.1, wireless quick charge technology and up to 8GB of Ram and 512GB of storage and what you have is a phone that's worthy of its flagship monicker. Size wise, the P30 Pro has a 6.47-inch, 2K OLED screen that has in-built fingerprint scanning - something that has also been greatly improved with this launch. The Huawei P30 Pro pre-orders start now, with the handset out in April. The 128GB SIM-free handset will retail at £899, with the 512GB version costing £1,099.